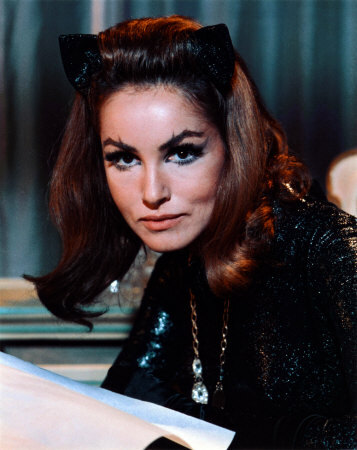 She's Fantastic: Batman '66 Julie Newmar CATWOMAN! Batman '66 Julie Newmar CATWOMAN! It's hard to imagine a time when Catwoman wasn't an everyday name in pop culture. Everyone knows her now. Even my Mom knows her. Girls who have never picked up a comic or watched a geeky movie want to dress like her for Halloween. I have no solid proof that Julie Newmar is the woman who catapulted the character to stardom, but I'd be willing to bet my Catwoman collection she is. Julie was definitely my first exposure to the femme fatale. The 1966 Batman Television series was in heavy syndication all throughout my childhood. So although I'm a child of the eighties, this sixties property is totally nostalgic for me. This figure itself has made me very happy. The original paint masters were unexpectedly stunning, but I honestly don't think anyone expected the finished product to really look like it. And honestly, it doesn't come close. But back at NYCC there was a production figure displayed that just looked disappointingly bland. I was very very let down after seeing that sample. But then I layed my hands on this figure this week and I am suddenly happy again. Let's check her out below! Catwoman comes with no accessories aside from her figure stand and collector card. The card doubles as a Batcave backdrop. The other characters in the series have other Batcave graphics on their cardbacks as well. Catwoman's articulation is very good and well-designed. Although her ankles and shoes are tiny so she needs a figure stand to avoid toppling over. She's very poseable and a lot of fun. Seriously the most fun I've had with a DC figure in a long time. Here are some images of the lovely Julie Newmar as Catwoman. From Left to Right: Mattel Arkham Asylum Catwoman, Mattel DCSH Catwoman, Mattel Batman '66 Catwoman, Mattel DKR Movie Masters Catwoman, DC Direct Hush Catwoman. She is very cool! I can't wait to get some more figures from this line. Currently I only have the SDCC Batusi set. I would love to see further versions of Catwoman. Batgirl would also be awesome. Not sure what Mattel's plans are, but hopefully they could release more characters on MattyCollector if retailers lose interest. LOVE her! Thank you for the review!!! Did you end up getting the Julie Newmar Barbie? I'm tempted as it's been on sale at TARGET for $30 (LCS has it for $52! ).